If bikers really are “swimming with the sharks,” good thing they’re not sharp-toothed burrito fans. Sari Lightman has spent years crafting her signature burritos. They come in vegan or vegetarian varieties, with pinto beans, rice, homemade salsa, and optional cheese or chipotle sour cream. She even has corn tortillas for those giving up gluten. They’re steaming, scrumptious, and salubrious, she says. They may also be the answer to some serious problems in this city. Here’s her plan: every Friday night, starting this week, Lightman will take over a catering kitchen in Parkdale. She’ll prepare her burritos to order, while her friend/bike courier/fellow burrito enthusiast Sammie Rising will make deliveries to wasted clubbers waiting customers from 6:00 p.m. to 1:00 a.m., by bicycle, anywhere south of Bloor Street, north of King Street, east of Roncesvalles Avenue, and west of Spadina Avenue. Well, maybe municipal wisdom isn’t refried along with the beans or mashed in with the guacamole, but that’s the sentiment behind Lightman’s new business venture, Burrito Bike, which she hopes will lead to her vision of a better Toronto: a bike-friendly city, with charming neighbourhood character strong enough to demolish the condo towers and commercial chains that are taking over the good old Mom & Pop establishments she used to know. “I think there’s a feeling of hopelessness in Toronto right now. You feel the brooding presence of a condominium across the street from you, or the growing tension between bikers and drivers. It saddens me this expansion is happening at such a rapid pace and we’re just accepting it,” she says. Lightman speaks specifically about her own neighbourhood of West Queen West, and the gentrification she notices between the boutiques and galleries she saw as a child with her aunt. After seven years of living and working in Halifax, she returned last year to developments and chains sprouting up throughout the neighbourhood. That’s why she has chosen the west end as the market for her after-hours Mexican munchies. Not only does this gentrification—and the pumping bars and clubs that come with it—provide an ample supply of ravenous ravers in search of healthy late-night snacks, but it’s also an opportunity to deliver a service that’s a little more home grown. Burrito Bike: Delivering sustenance and sustainability, with optional cheese and sour cream. These are some pretty high hopes for an idea that started as a way for Lightman, one half of the band Tasseomancy (formerly Ghost Bees), to supplement her musician’s income without having to “feed into the depressing system of being an artist and working full time at a café.” She and another musician friend started the original Burrito Bike in Halifax, which grew into a team of five to six bikers while the two creators handled the kitchen, sometimes selling over two hundred burritos in a night. Before she knew it, she was combining two of her passions, burritos and biking, to make ends meet (hold the meat), while spending a typical Saturday evening hanging out with friends. The more she speaks about the social and environmental implications of Burrito Bike, the more impassioned Lightman gets. She mourns the loss of iconic neighbourhood establishments that have had to close under the shadow of the megatowers, and fumes over the disregard that drivers show their manually powered compatriots. Pretty soon it’s clear that, for her and possibly the city at large, the benefits of her business go deep like the levels of a good seven-layer dip (mmm, we may recommend that be next on the BB menu). 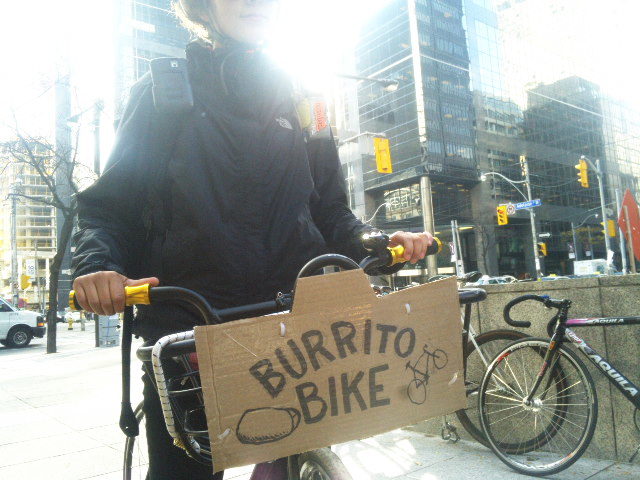 But with our city’s bounty of burrito booths around town, it’s unclear yet whether Burrito Bike Toronto will gain steam, especially with flyers, Facebook, and word of mouth as their only means of promotion. But, grandiose dreams of social change or not, the point of Burrito Bike is not to become widespread. So this Friday night, if you find yourself in the west end pondering the poutine or sussing out the street meat, perhaps call Burrito Bike instead at 416-948-6676 before 12:30 a.m. And maybe you’ll have one less regret in the morning.